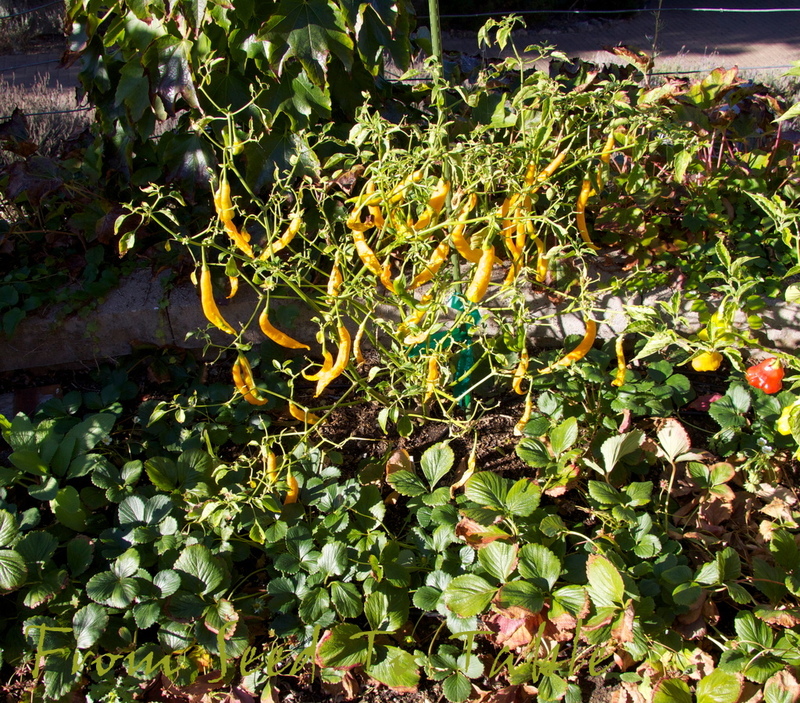 The stars from the garden this week were the chile peppers. Here's a mix of Chorizero (top), Aji Pineapple (yellow), and PI593480 Morocco (bottom). 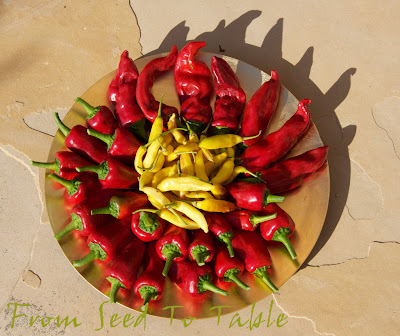 The Chorizero peppers are a mild seasoning pepper from Spain, I'm drying those in my dehydrator since the weather is not at all conducive to sun drying at the moment. I used half of the Aji Pineapples in a batch of Spicy Meyer Lemon Marmalade. Some of the Morocco peppers, which are completely sweet but have spicy flavor, were starting to wrinkle and dry on the plants so those went into the dehydrator. 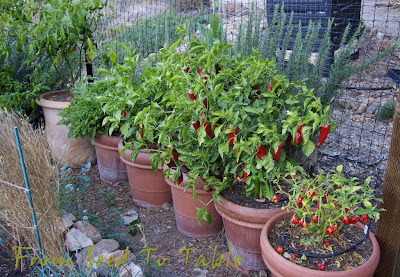 I think the Morocco peppers will make a very good flavored sweet paprika. I'm going to experiment with stuffing and baking the rest of the Morocco peppers. The next bunch of peppers are Espelette and Topepo Rosso (center). 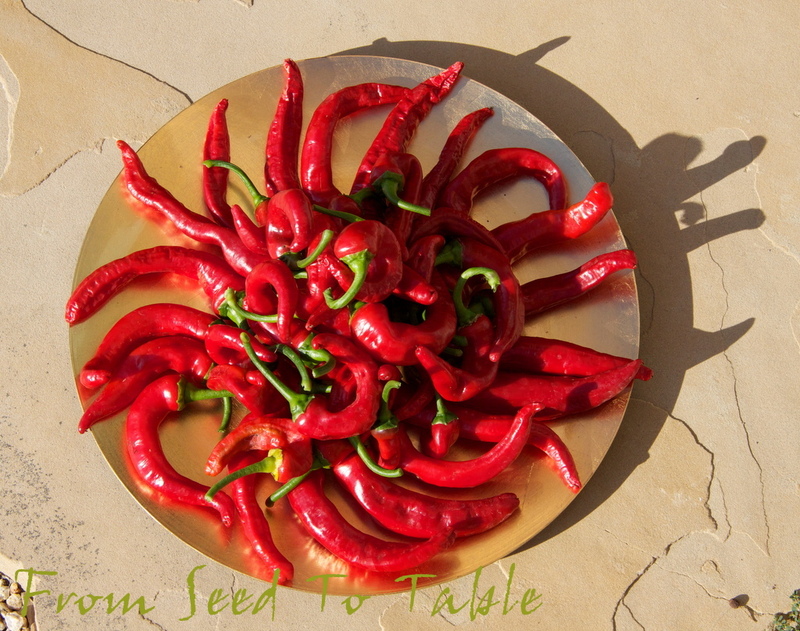 The Espelettes are a Basque pepper that makes a mild ground pepper, those are in the dehydrator. 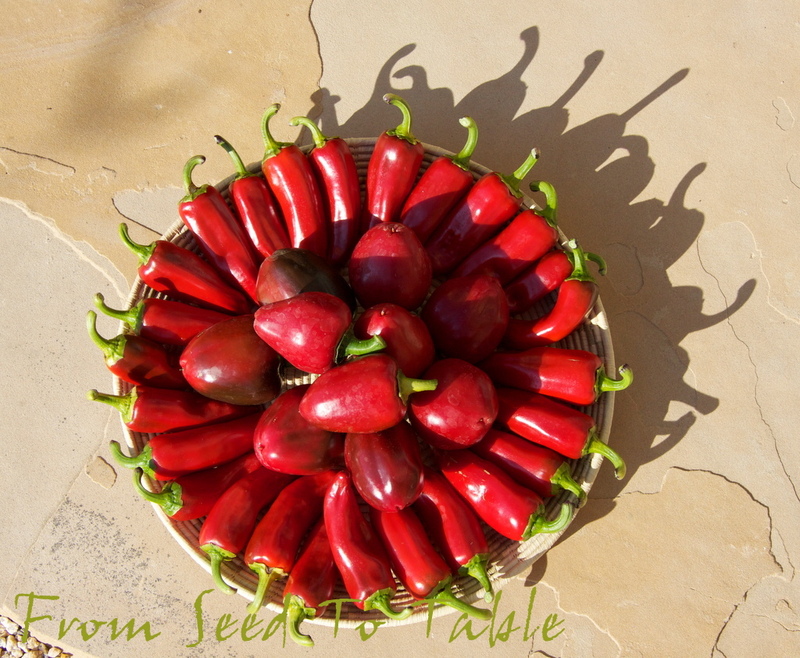 I've not yet decided what I'm going to do with the Topepo Rosso peppers, they are somewhat spicy, so far I've roasted them and incorporated them into salsa. I think they might make a good roasted pepper paste that I can freeze. This is all Iberian Cayenne peppers. Hmm, I don't think I've sampled one of these yet, so I don't know how spicy they are.... Most of these are in the dehydrator also. 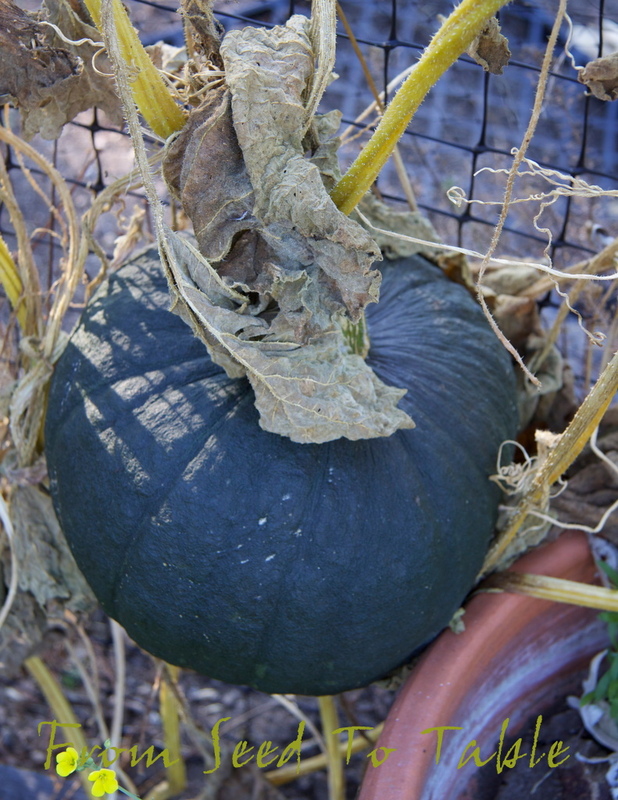 And another shot of the Marina di Chioggia squash that is shown in my previous post about how I plan to use it. So far I've made the risotto, lentil salad, and panzanella from this one squash and there's still half of it in the fridge. There are lots of great ideas for preparing winter squash in the comments to that post, along with some links that I've included for some of my favorite recipes. This particular specimen is not true to type, it should be more flattened with a turban shape, but the flavor and texture have been good so I'm not really complaining. 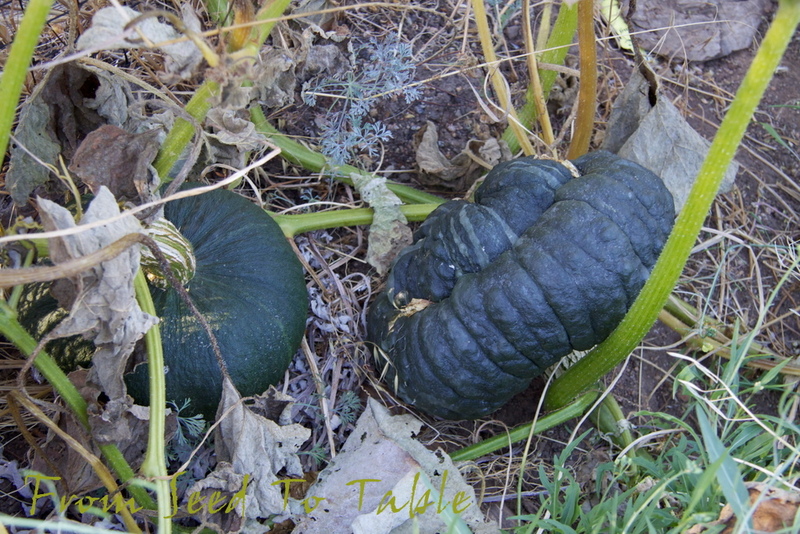 I've still got three more good sized squash in the garden waiting to be harvested, so keep those great ideas coming! 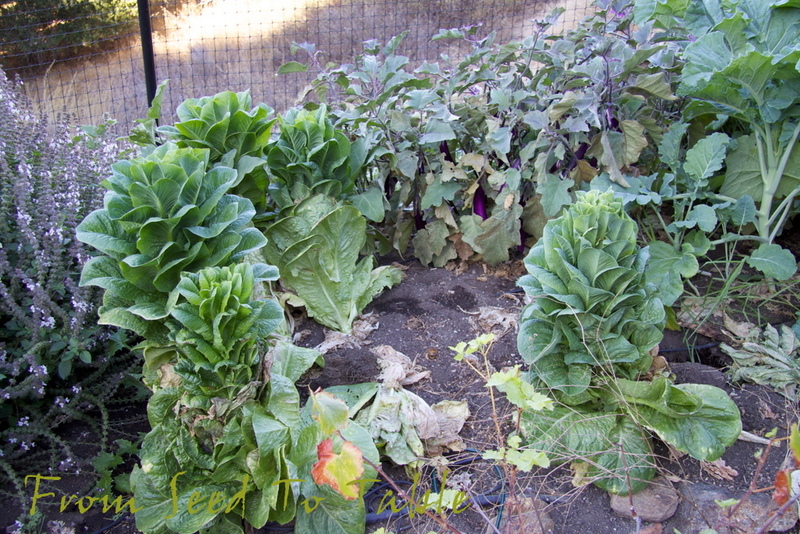 Here's what is probably the final harvest of Diamond eggplants. I sliced these lengthwise about 1/4-inch thick and grilled them on my stovetop ridged griddle, rolled the slices up with a bit of fresh goat cheese and served them just warmed through in a freshly made sauce of grated tomatoes (Andine Cornue paste) seasoned with a chopped salted anchovy, chopped salted capers, garlic, and parsley that was all sizzled in olive oil. Oh boy, was that good. 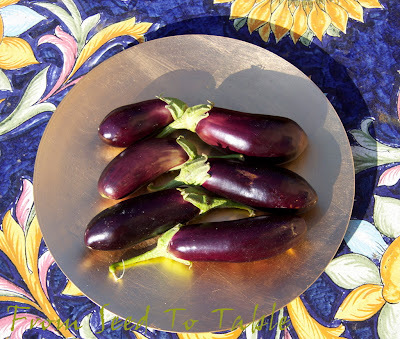 I've got frozen grilled eggplant slices in the freezer that I think I'll use to make that again. 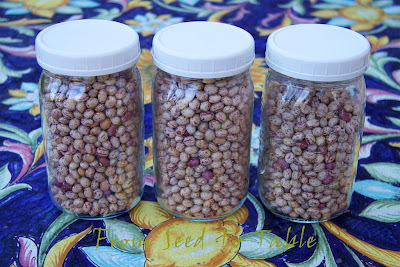 I also shelled the dried Turkey Craw beans and the last of the Petaluma Gold Rush beans. 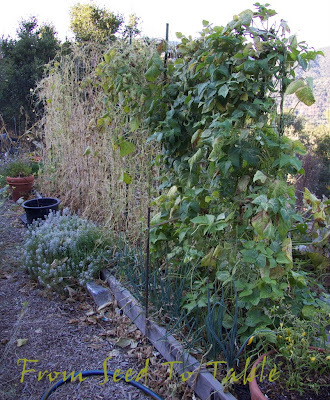 Petaluma Gold Rush beans - 1 lb., 15.25 oz. Turkey Craw dried beans - 1 lb., 10 oz. 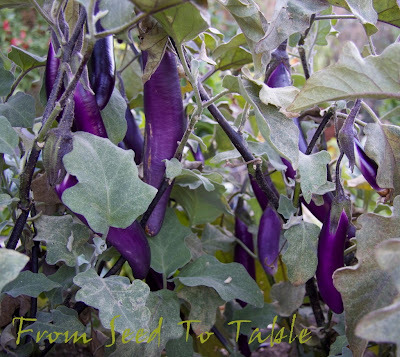 Diamond eggplant - 1 lb., 2.75 oz. 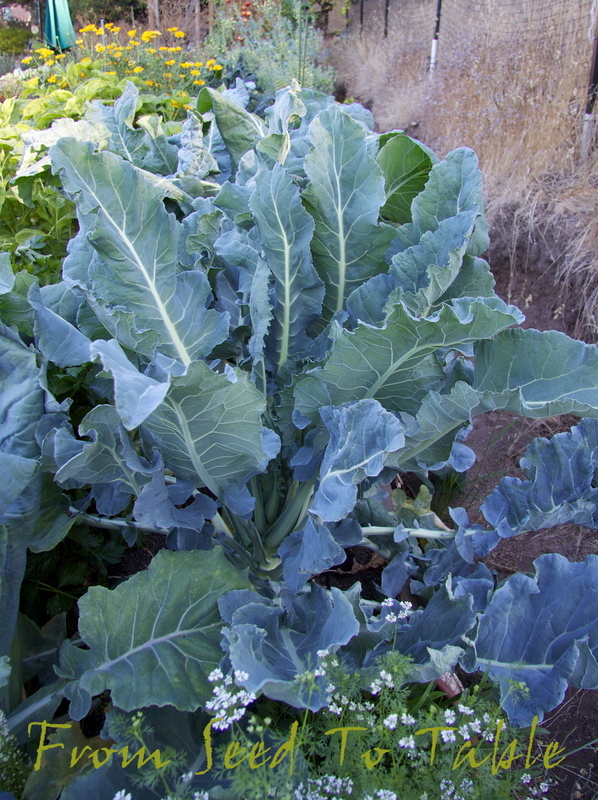 Portuguese Dairyman's kale - 5 oz. Aji Pineapple peppers - 4 oz. Chorizero peppers - 7.25 oz. Espelette peppers - 2 lb., 1.25 oz. 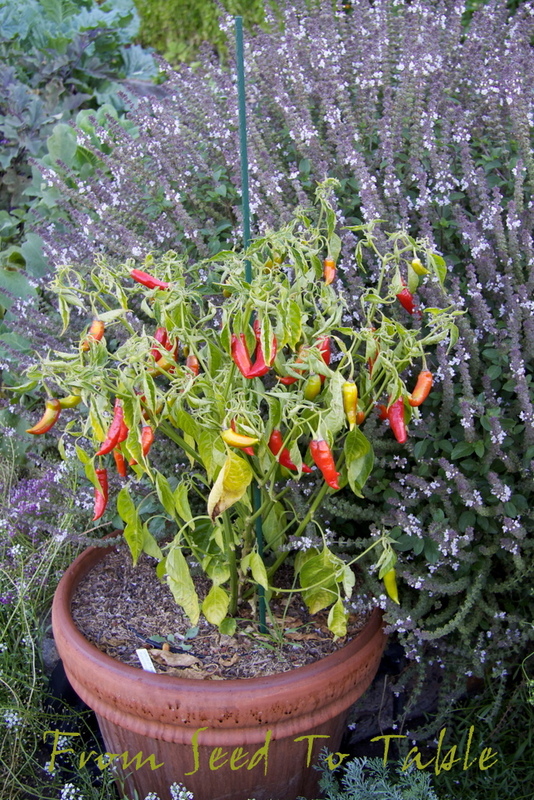 Iberian Cayenne peppers - 1 lb., 7 oz. PI593480 Morocco peppers - 14.5 oz. Topepo Rosso peppers - 1 lb., 9 oz. 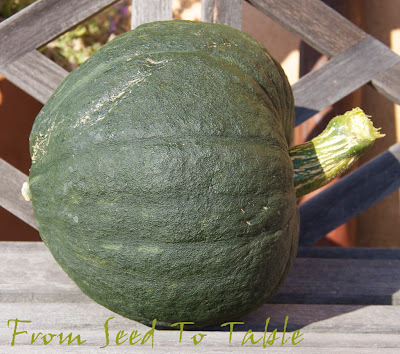 Marina di Chioggia winter squash - 10 lb. 12.25 oz. The total for the week was - 22 lb., 11.25 oz. 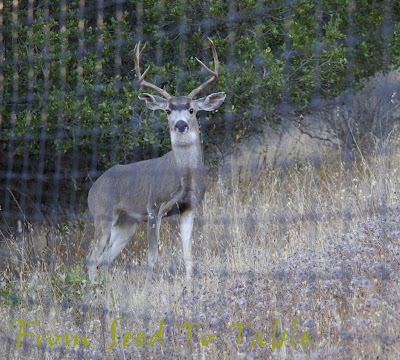 The totals for the year are - 601 lb., 7 oz. 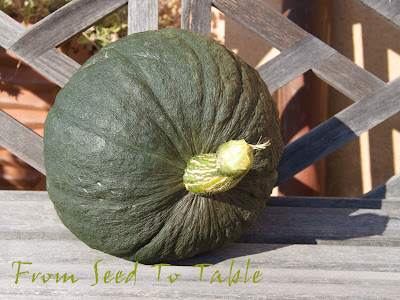 What To Do With an Almost 12-Pound Squash? What's you favorite way to eat winter squash? I've updated the post to include links to recipes that I use or that inspired me for some of the dishes shown above. Something new in the harvest basket! 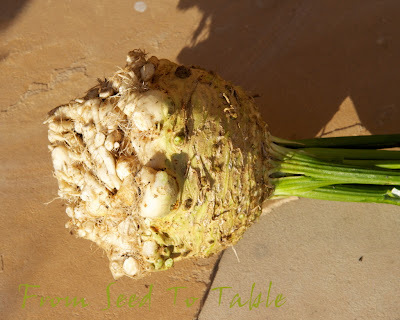 The Diamante celery root is ready to harvest and here's the first one. 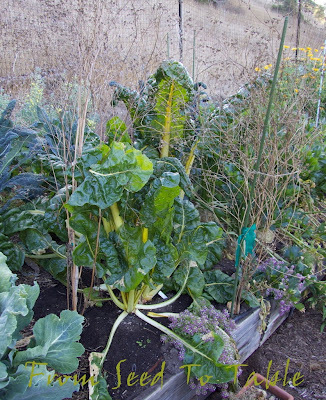 This formidable looking vegetable needs some serious trimming to get to the good stuff. With skin and knobs still attached, but no stems, this specimen came in at 2 lb., 13 oz, and after trimming I netted about 2 1/3 pounds. I made a celery root and dried fava bean puree with half of it and celery root remoulade salad with the other half. 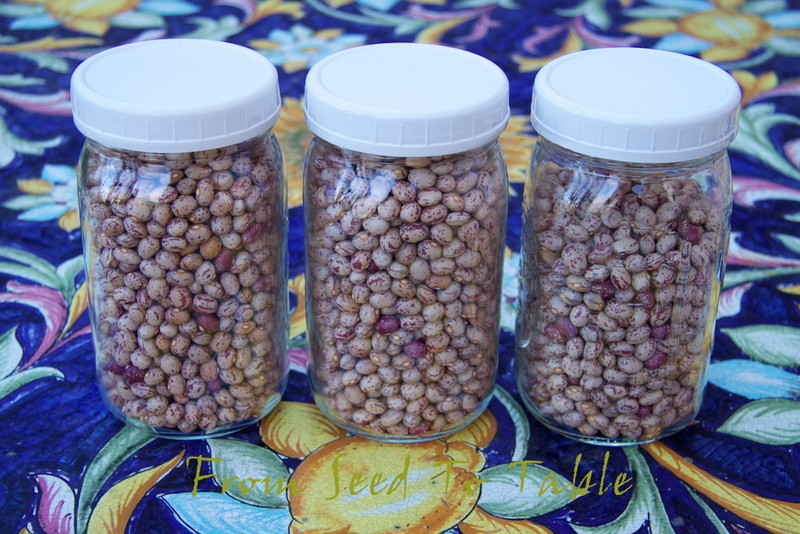 And here's my growing stash of dried Petaluma Gold Rush beans, this is 5 pounds of beans and I still have one more basket of beans to shell. 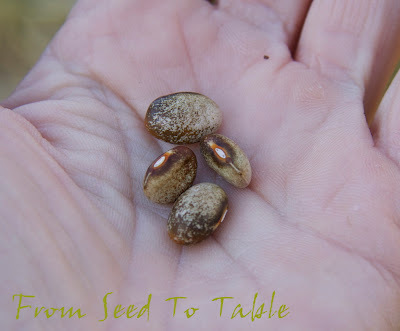 There's plenty of beans for both eating and sharing as seeds. Yesterday we had some rainy weather come through so before it hit my husband and I picked the remaining tomatoes that were edible looking. You can see that some of them have small bad spots but if I use those right away they should be ok. 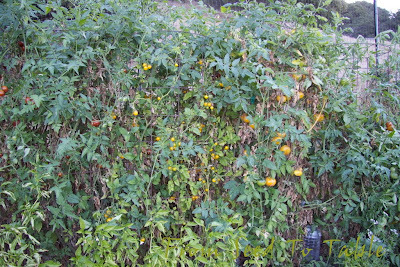 There were a lot of overripe and rotting tomatoes on the plants, penance for 3 weeks away. The late producing Lenny & Gracie's Kentucky Heirloom were the most prolific. 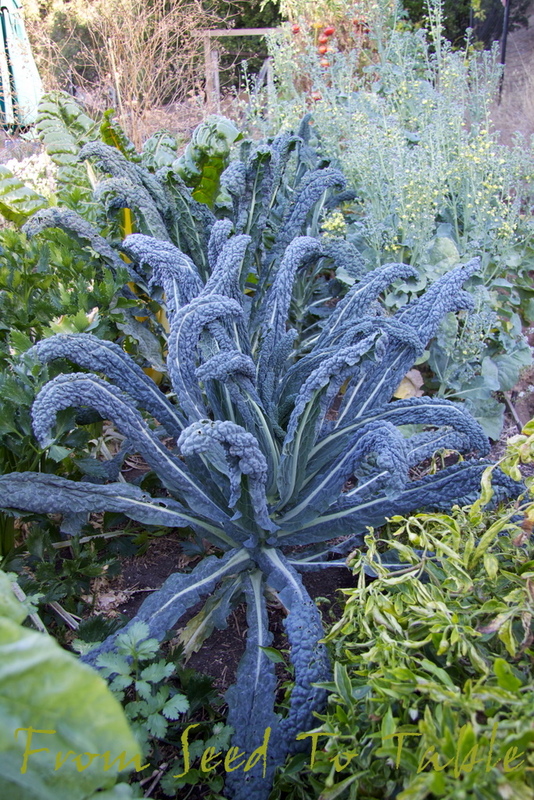 Had I been around during the past three weeks I think that the harvests would have been impressive. 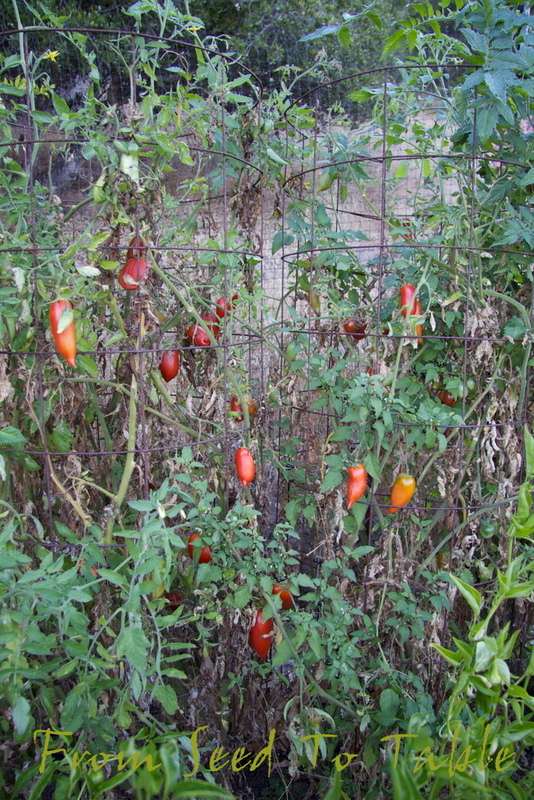 The other late tomato that I'm growing, Not Wes, didn't fare well, the plant succumbed to some disease and the many tomatoes on the vine were mostly shriveled or rotting. Not photographed were a couple of pounds of Malaysian Dark Red eggplants that I used to try to replicate a dish that we enjoyed in Italy. It was bruschetta topped with a mixture of chopped flesh of roasted eggplants, olive oil, garlic, and mint. I also seasoned the eggplant with a dash of red wine vinegar to brighten the flavors. If memory serves me correctly I came pretty close to the delicious original. Petaluma Gold Rush beans - 3 lb., 11 oz. Diamante celery root - 2 lb., 13 oz. 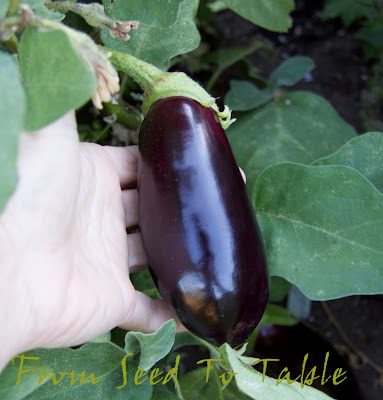 Malaysian Dark Red eggplant - 6 lb. Portuguese Dairyman's kale - 1 lb., 3 oz. 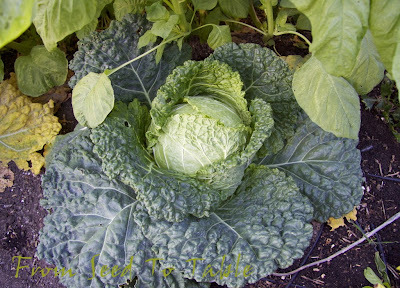 Sweetie Baby romaine lettuce - 1 lb. Ananas Noir tomatoes - 2 lb., 11 oz. Andine Cornue tomatoes - 3 lb., 4 oz. Aunt Ruby's cherry tomatoes - 2 lb., 10 oz. Chocolate Stripes tomatoes - 14 oz. Galinas cherry tomatoes - 2 lb., 2 oz. 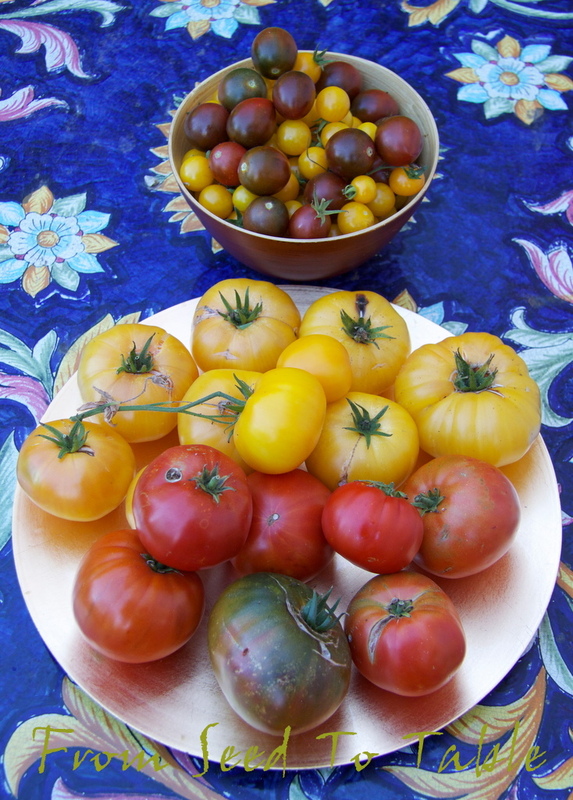 Gigantesque tomatoes - 1 lb., 15 oz. Lenny and Gracie tomatoes - 5 lb., 6 oz. Not Wes tomatoes - 4.75 oz. 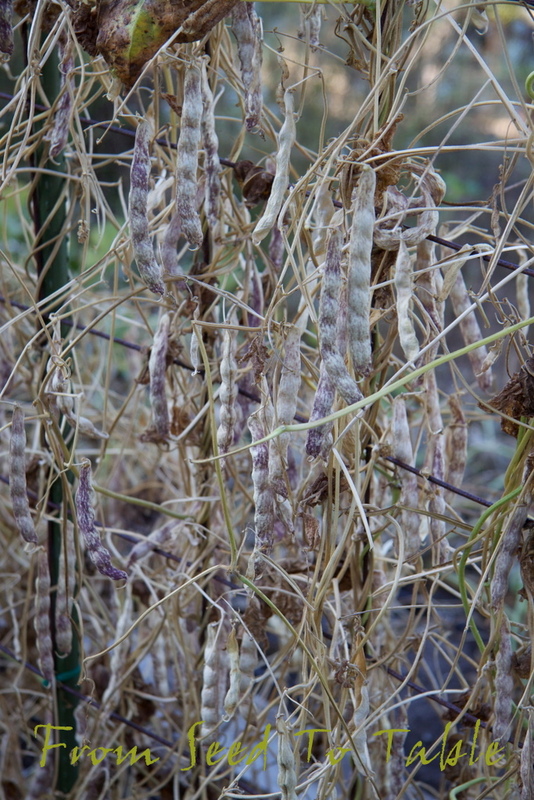 The total harvest for the period was 34 lb., 2.5 oz. 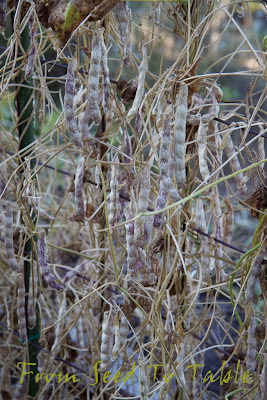 The harvest totals for the year are 578 lb., 11 oz. 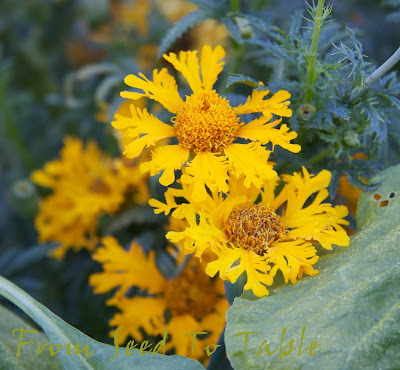 Daphne's Dandelions is the place to go to find more Harvest Monday posts. Head on over there to check it out. I've been away from the garden for the past three weeks enjoying a fantastic vacation in Italy and the garden looks like it. 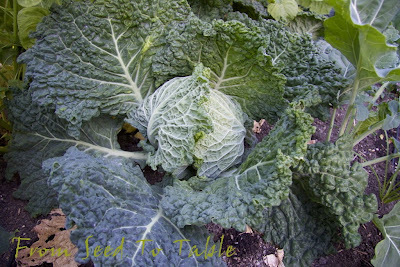 Three weeks on autopilot has made the garden unsightly but the damage from neglect was fortunately minimal. 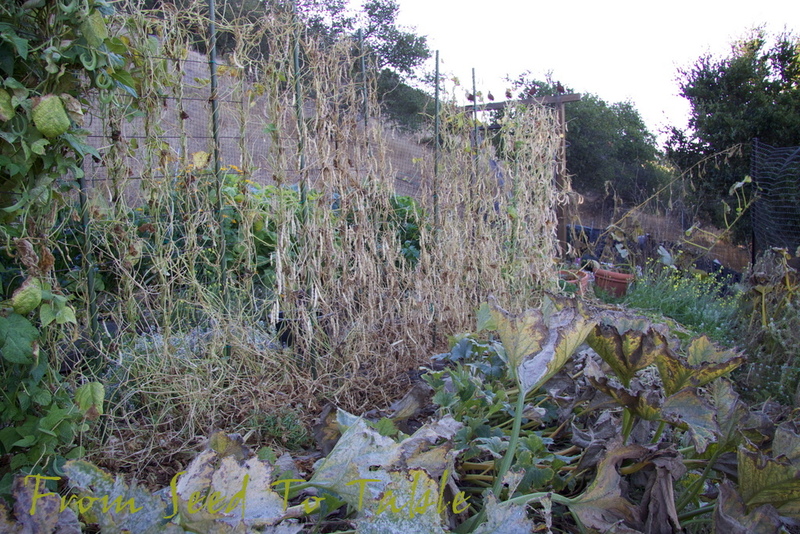 The worst of it was tomatoes that were green when I left but overripe and rotting upon my return. 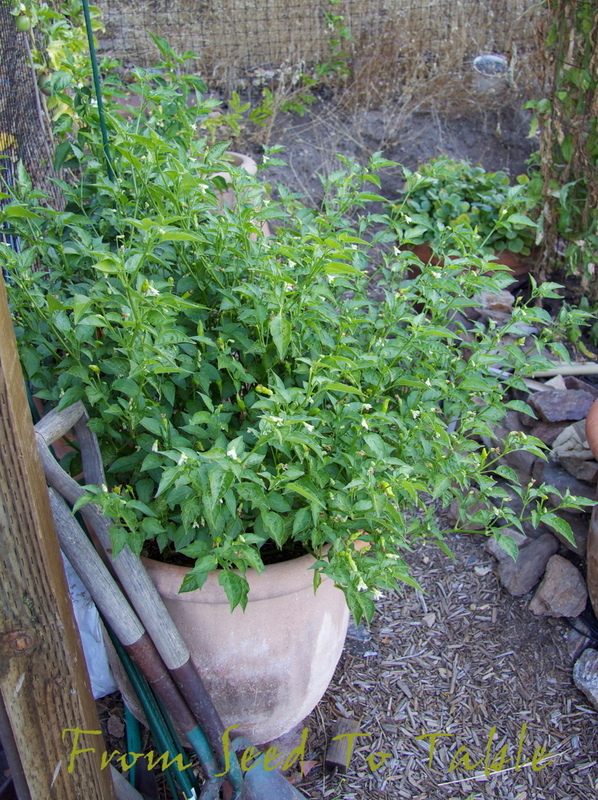 A pepper plant resented the heat wave that struck soon after I left. And the landscape drip system went on the fritz so one of my potted caper bushes is decidedly crispy looking and a bunch of other plants look a bit parched but should be okay. So, let's take a look at the messy vegetable garden. Most of my potted pepper plants are doing just fine, although you can see one here (I forget what variety) that dropped most of its leaves but still has a bunch of ripe peppers. 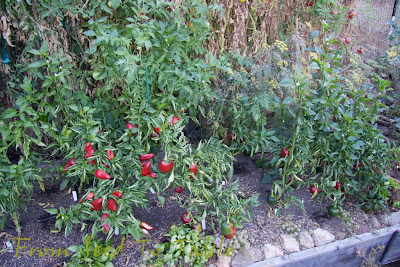 Next to it the 2 Esplette plants are loaded with ripe and ripening peppers. And the other plants are green and lush but don't have any ripe peppers yet. 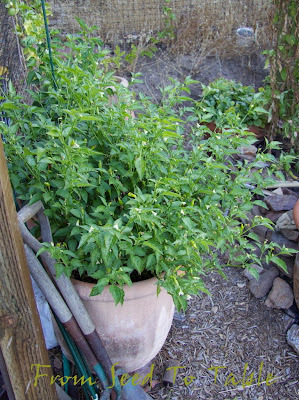 This plant shown below is an Aji (baccatum) that was growing in the pepper bed last year. 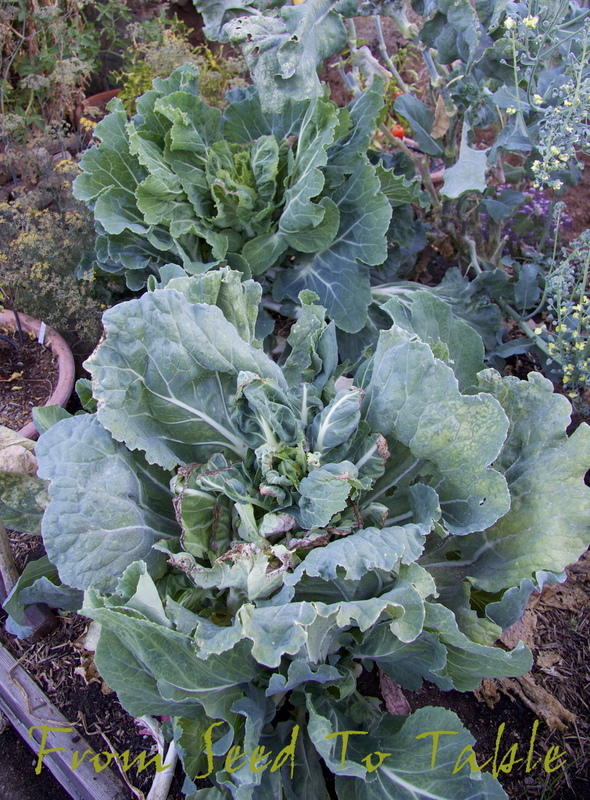 I dug it up this spring and put it into a pot and it sulked all spring and summer - look at it now! Unfortunately, I'm not sure if it will produce any ripe peppers, they are all still small and green. Most of the pepper plants in the beds are looking pretty bad, but the Morocco and Topepo Rosso plants are ok and have some ripe peppers, although a number of them are starting to shrivel. This is a new variety of baccatum pepper that I'm trying this year, Kaleidoscope. 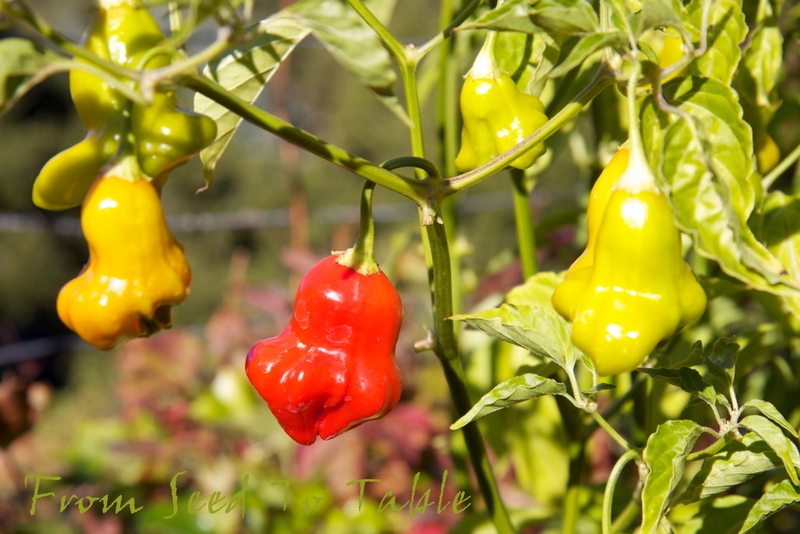 I'm pleased to see that it is producing ripe peppers before the weather gets frosty, in spite of looking rather unhealthy.. A number of baccatum peppers are very late to ripen and I've grown a few that produced pods that never had a chance to ripen. One of my favorite peppers, Aji Pineapple, has been looking bad for a long time, but it has managed to produce just enough peppers for a batch of Spicy Meyer Lemon Marmalade. And another new baccatum pepper, Guyana has turned out to be a winner. 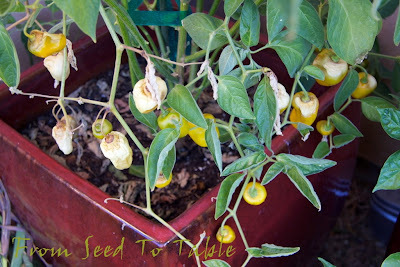 This plant is looking sad now but it is loaded with a bunch of ripe peppers. 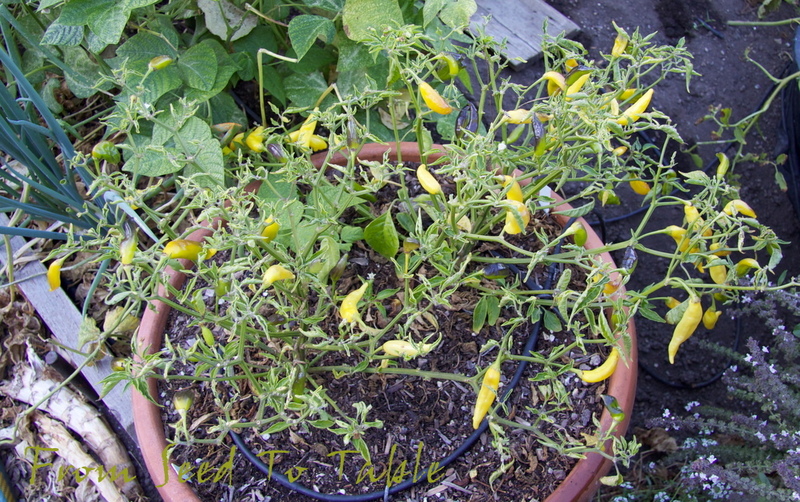 I picked a like number of ripe peppers off this plant just about 4 weeks ago and put them into the freezer whole. I plan on trying another batch of marmalade with this variety. 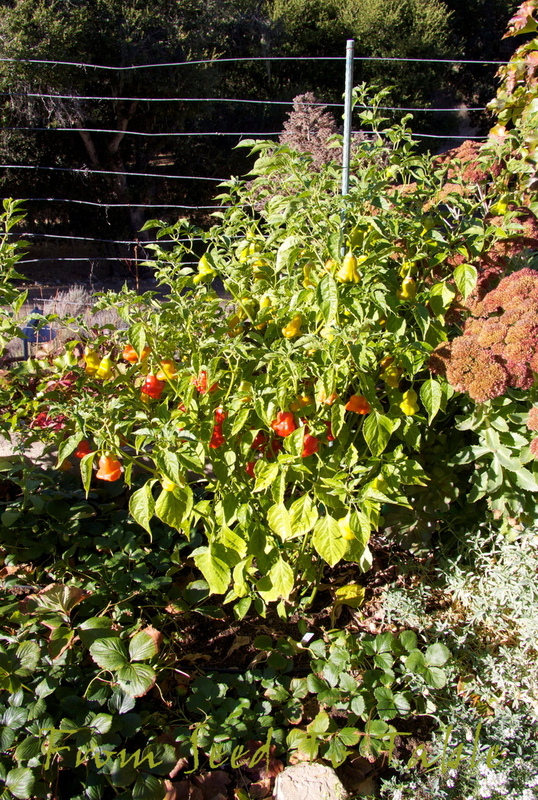 Another winner that I grew last year and had to have in the garden again this year is Christmas bell, a mild baccatum pepper that is delicious pickled as well as raw, roasted, or sauteed. I planted three Christmas Bell plants this year just to make sure I have enough. Last year they started to ripen much earlier, they were actually one of the first. The sad sad Manzano chiles, they didn't like the heat. 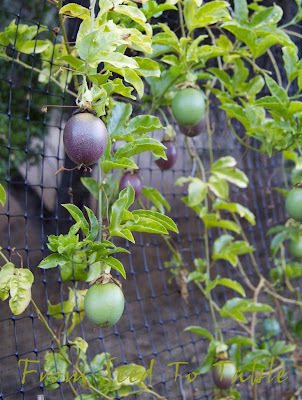 The Frederick passionfruits are finally ripening. 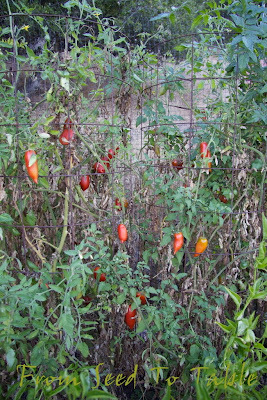 Another round of Andine Cornue paste tomatoes on some very tired looking plants. Cherry tomatoes keep on going.... 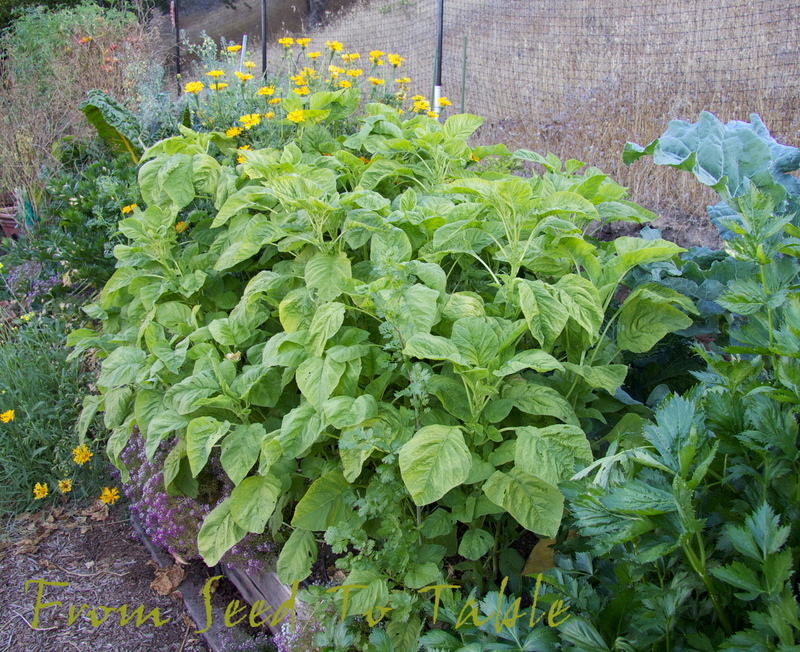 I also found some sound Lenny and Gracie, Chocolate Stripes, and Ananas Noir tomatoes on the plants yesterday. Across the way the Sweetie Baby Romaine lettuce is shooting up. They aren't tasty to me at this point but the chickens don't care, they still love to munch them. 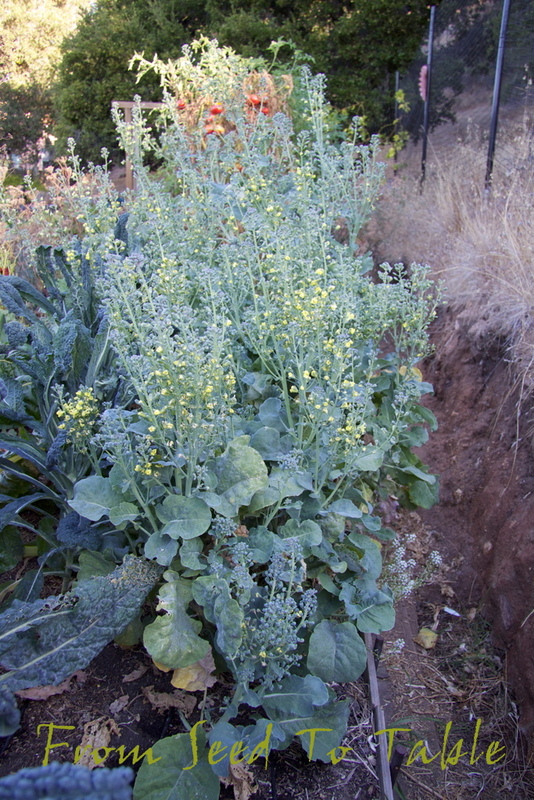 There's Portuguese Dairyman's kale volunteering where last years plants dropped seeds this spring. I harvested a bunch for dinner last night and it was delicious braised with some olive oil and garlic and mounded on toasted rustic bread and topped with a fried egg. Way up in the top right corner of the photo the dead chamomile plants can be seen, I picked blossoms from those plants for most of the summer. That little tiny patch produced enough to keep me in tea for most of the winter. This was a wonderful surprise, a perfect looking Diamond Eggplant. I stripped the plants of any fruits that were larger than an inch long just before I left three+ weeks ago and the little babies that were left then are a perfect size now. I also stripped the Malaysian Dark Red plants and now there's a bunch of them again, some even got a bit too big after only three weeks. 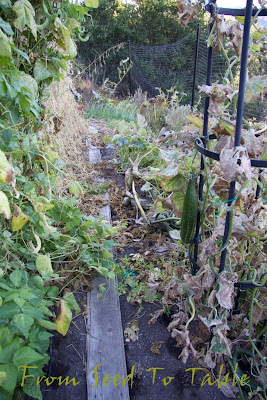 Here's where the garden starts looking really sorry. The bean plants are mostly done, the Garafal Oro romano plants on the right are producing a few little beans that should be pretty good, but the Petaluma Gold Rush and Turkey Craw plants have dropped their leaves and are covered with dried and drying bean pods. The cucumbers, zucchini, melons, and winter squash have succumbed to powdery mildew. I think the Marina di Chioggia squash matured enough before the vines pooped out. 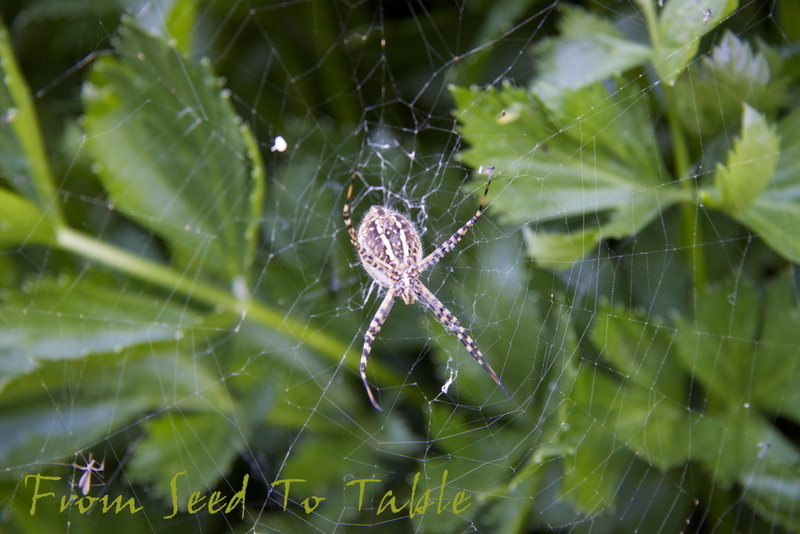 I'll leave them on the vines until the stems turn brown. 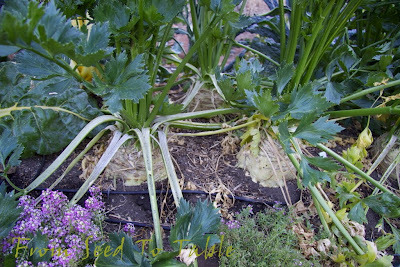 I need to start harvesting celery root, it's getting to be quite large. Last year my celery root took nearly a year to size up, the plants have been much happier this year. Was it the cool summer? Bummer, the Couve Tronchuda (Portuguese cabbage) is bolting before I even got to harvest any. I'm going to try starting some more right away, I really want some Caldo Verde this winter. The chard is monstrous and full of black aphids, I'm going to have to cut it done to the nubs and hope it comes back ok. The sole surviving Summer Snowflake marigold is in full bloom. Earwigs love marigold seedlings, I had to put this plant under a water bottle cloche to protect it from getting munched. Now that summer weather has finally arrived (it got up to almost 100F while I was gone and is in the 80'sF now) the amaranth is growing like a weed. 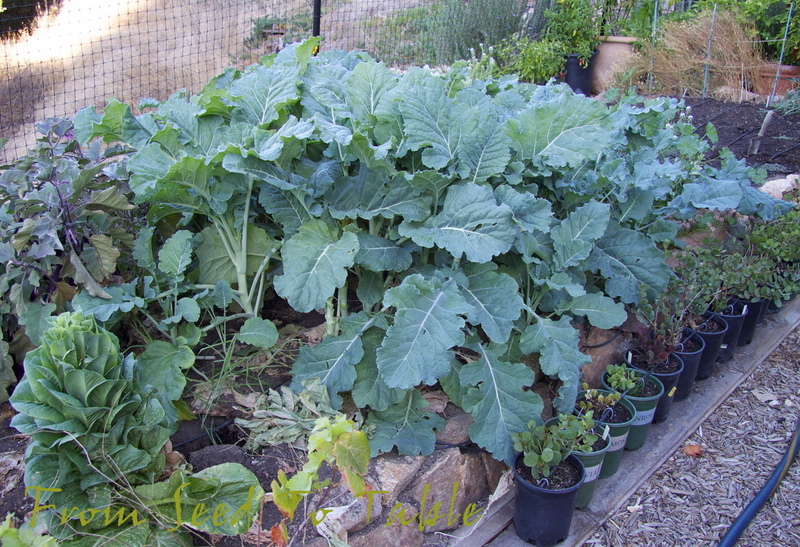 I think it's a bit over grown now and may not be very tender, but I'll try some of it anyway. A lovely garden spider hanging out in the Hollow Pipe of Malines cutting celery, which happens to be bolting, dang it. 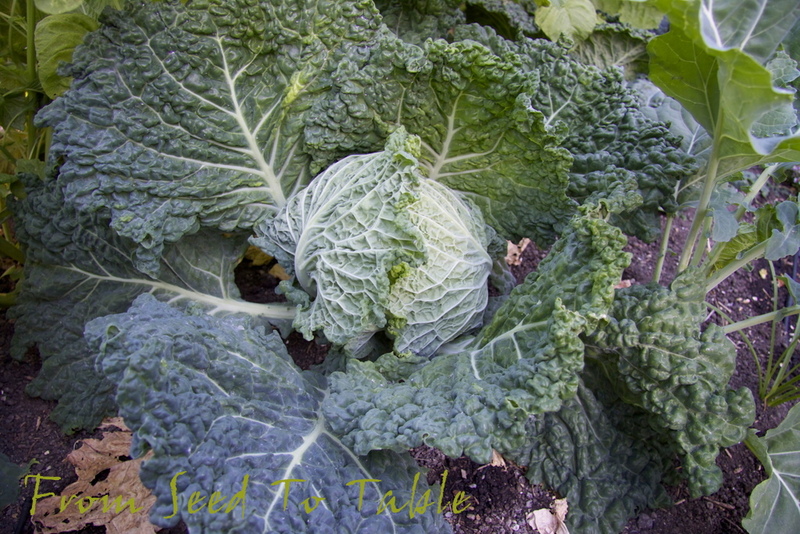 Testa di Ferro savoy cabbage, already producing heads, I thought they still had a couple of months to go. Cavolo Nero, looking fabulous, It's time to start harvesting. Broccoli in full bloom, it needs a bit of a trim. I was wondering why the does were dashing around the hillside today, tis the season for making fawns. Look, here's a plant that the deer don't denude of flowers! 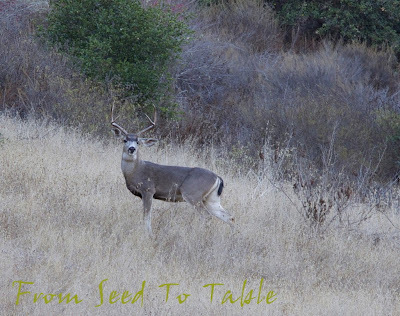 It drives me crazy when I plant something that the deer don't eat, except for the flowers.